Chrome Version 7.0.529.0 canary build has the Labs feature “Instant” which Makes the address bar load urls as you type. 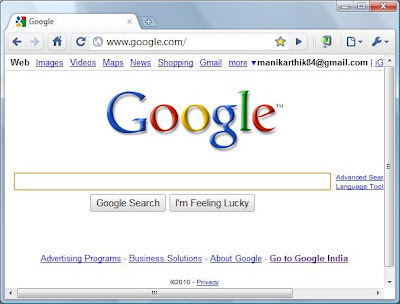 After Google Instant, Youtube Instant, iTunes instant, now Chrome Instant is ready. For the sites, that you have visited already, you will see the sites directly loading, before you press enter (after typing the url). If you want to try this, Download and install Chrome’s Canary build (auto updated every week). Disclaimer: Google Chrome Labs is a testing ground for experimental features that aren’t quite ready for primetime. They may change, break or disappear at any time. 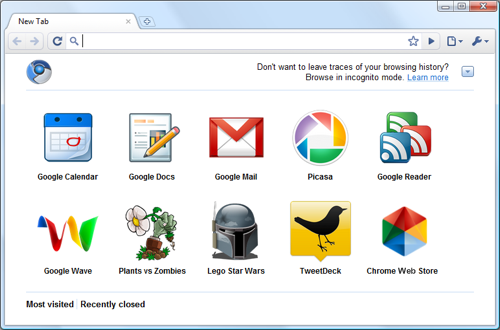 Google Chrome has a labs tab (about:labs), where Chrome developers test few Labs features. One of those is Side tabs. I don’t prefer to use Side tabs. Not sure if this will be promoted in Chrome. The newest labs feature is Tabbed options (chrome://options), which is available now in Canary Build (Download), that brings the Browser options in a tab and makes it easier to configure the browser. 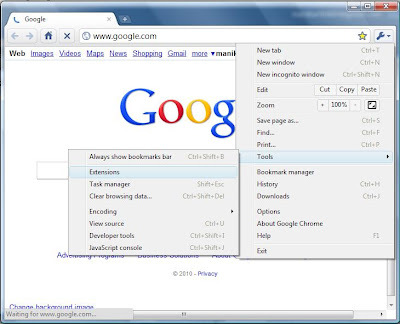 (By default, Chrome opens a popup window with the options, just like any other browser). If you want to try this, Download and install Chrome’s Canary build (auto updated every week). 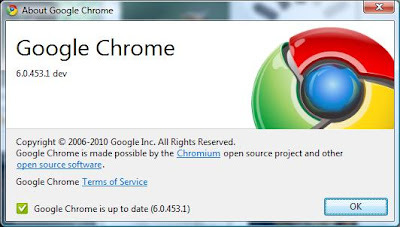 You can install this version of Chrome in addition to the version you are already using. Once you install, type about:labs in the address bar, to choose the labs features you want to use. Labs feature is also available on Chrome Version 7 and above. In the latest version of Chrome (6.0.472.0), just after the installation completes, you will be asked to Choose the search engine to be used in the Omnibox. ie, Google / Yahoo / Bing ? 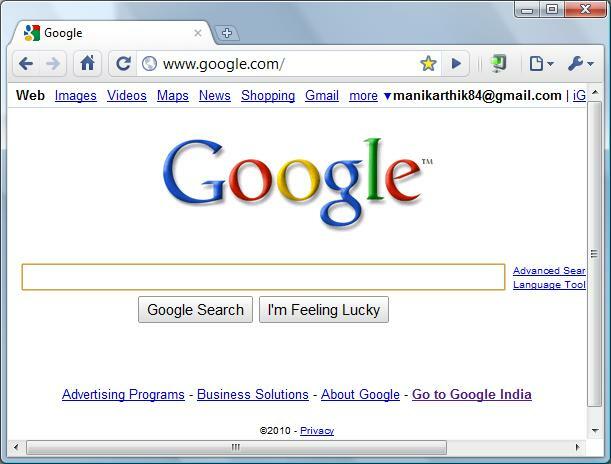 Remember, even the very old versions of Chrome, had an option to change the default Search engine for the Omnibox, but in this version, you will be asked in the very first time of using Chrome. Only that is the difference. 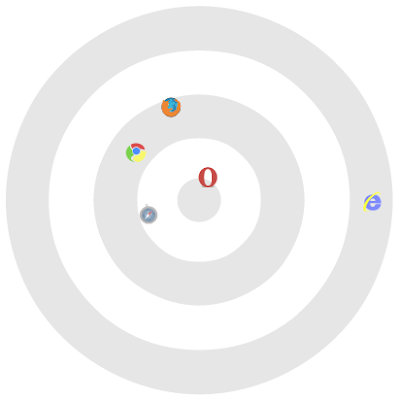 I am stilling facing problems with Chrome in Windows Vista. It is often crashing. Whoa !! In Chrome V 6, there is only one menu button (The Settings menu with the spanner icon). The previously existing Tools menu is added as sub menu in the Settings menu. This makes the UI to look much simpler. Read A fresh coat of chrome. I noticed something new in the Google Chrome’s address bar, which is the new pop-up blocker icon. Just click on the icon in the address bar (window with a red X) to see the popups blocked, and to control the pop-up blocking for the particular site. I believe this version is now available only in Chrome’s dev channel. If you are using Google Chrome browser, you need not look for a translate option in the website you are trying to read. 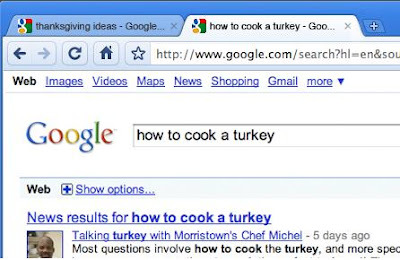 You don’t even need to use Google Translate extension for Chrome. Chrome comes with an In-Build translation feature which automatically identifies the language of the webpage, and offers translation. Try translating, and let me know how this works for you.